Skiing is the ultimate sport filled with adrenaline and fun, and such an epic sport deserves equally epic gear! This popular brand pulls out all the stops with its women’s Outdoor Winter Ski Snowboard Set! The flashy neon colors in this pants and jacket duo are sure to make you the most stylish woman on the hill this winter. ⇨ Block out the elements with the windproof and waterproof features of this women’s jacket and pants combination! With this feature, you can stay nice and warm for longer and enjoy your time on the hill more! ⇨ Ever lose your favorite jacket to the dreaded nuisance of pilling? Make that a problem of the past with this women’s snow jacket and pants. The sturdy materials in this ski set ensure that your jacket will withstand the test of time without starting to pill so you can enjoy your beloved set season after season! ⇨ Don’t get overheated on the hill this season with the breathable feature of this women’s jacket and pants combination! Skiing is hard work and you are sure to build up a sweat, but the high-quality polyester and cotton material in this women’s ski set wick away sweat from the skin so you don’t get too stuffy! It also allows air to flow through your clothing so that you can be at the perfect temperature all day long. ⇨ While this women’s ski set prevents water from soaking into the clothing, it also makes sure all water on the surface of your jacket or pants dries quickly so that you can stay as warm as possible! Waste less time warming up in the lodge with this quick-dry feature that lets you stay as dry as you can be. 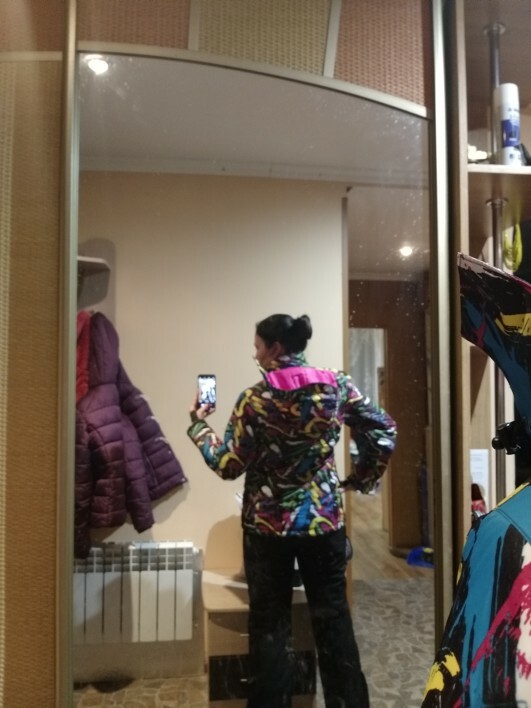 ⇨ Having your ski clothes shrink and wrinkle is an all-too-common problem in the world of snow-sports, but this women’s ski set has conquered that problem! The strong materials in this set ensure that your clothes will not shrink or wrinkle so that you can wear them for years on end. The suit. All fit in size. Super. You Can order one size larger, but not critical. Thank You Very Much. Order came for three weeks in RF. The parameters of 93-80-100 weight kg Height 169 size M is OK, leg and a good length sleeves. Seller recommend L, well not listen. Quality jacket 4-sometimes stick straight fringe hlipenkaya zipper. The Jacket is not as bright as promofoto, quite soothing colors. Pants in 5, although the. The Color of pants sent me another, ordered pink, went black. A dispute, the seller zero response. The Dispute resolved Aliekspress the back half of the cost of the pants. Principle of the money it is a good buy, but very upset because of different color so the whole suit do not like.